#29 VALENCIA: La Ciudad De Los Artes, Sciencias y Paellas! All wrapped up for Valencia, Spain. Weather forecast was 7-15 Celsius. Partly cloudy, light rain. Leaving at 4 am for the 4 hour drive from Madrid was a curse. Best decision I ever made was to bring my pillow in the car. 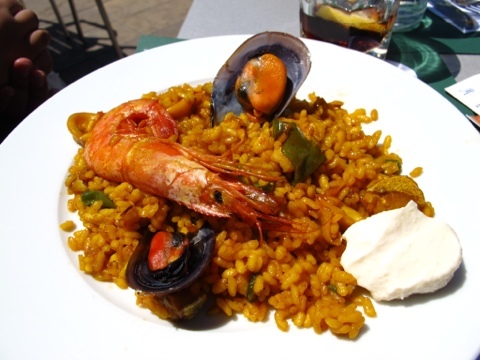 The next 4 hours was put to good use………waking up fresh and not so grouchy in the place where paella was born. But that’s lunch. As we arrived well before opening times of many churches, museos and parks, there was plenty of time. 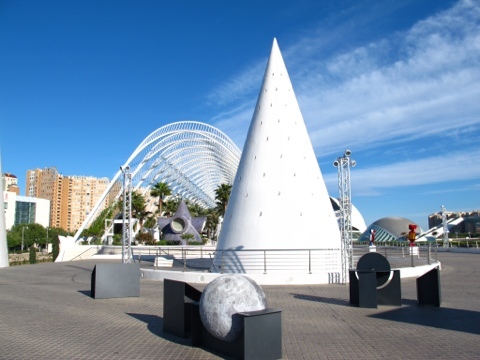 As the car dropped us off at the Ciudad de Los Artes y Ciencias, the wind chill dropped from 7 Celsius to 14, and temp’s rising. Not bad. It’s cool and pleasant. 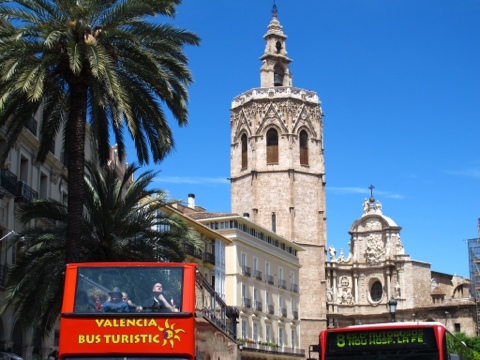 Many tourists visiting Valencia had this itinerary uppermost in their minds. 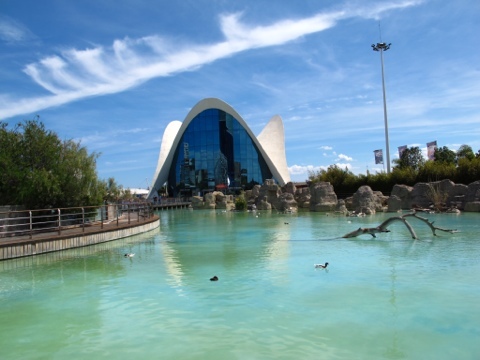 In fact, our hired driver only knows how to drive to this Park where his paying clients spend their whole day in the Park designed and created by Calatrava in some very futuristic design, then heading back to Madrid without even visiting the historic center. I won’t do that. 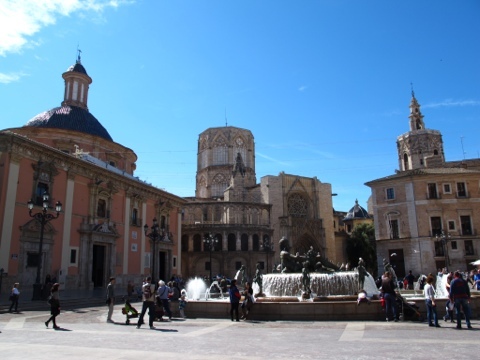 If made to choose, I can skip the Park altogether and concentrate on Valencia’s Cathedral, Torres, Plazas, Fontanas and Museos. 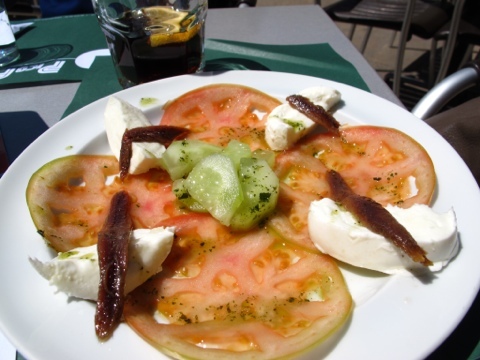 Not to forget, I will never ever pass up the chance to order that paella in this historic place where Paella was born! Who would? We had our best paella in Valencia. And guess what? We had San Miguel Cerveza here too. But we were in for a better surprise. 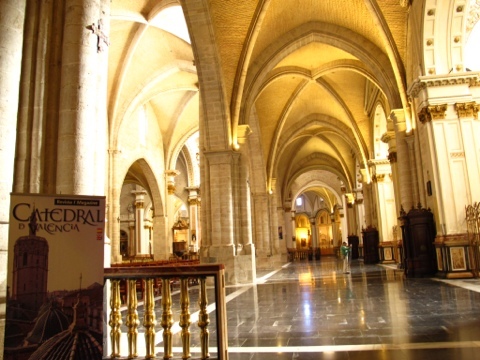 The Cathedral has a special chapel which allegedly houses the “Holy Grail”. Behind a protective glass panel is the chalice which was reportedly used by Christ in the “Last Supper”. The Chapel is not big. Maxed out, it can seat maybe 50 pax. The door to the chapel has stone carvings and not huge at all. 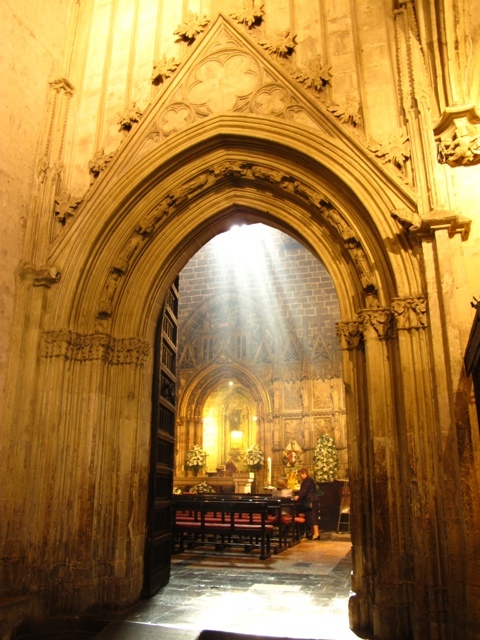 And if you stand just before the door, you’d find sunlight beaming right through the area where the chalice is kept. They say there are many legends involving many cups claiming to be the Holy Grail. Me? I have not heard of any. Till NOW. 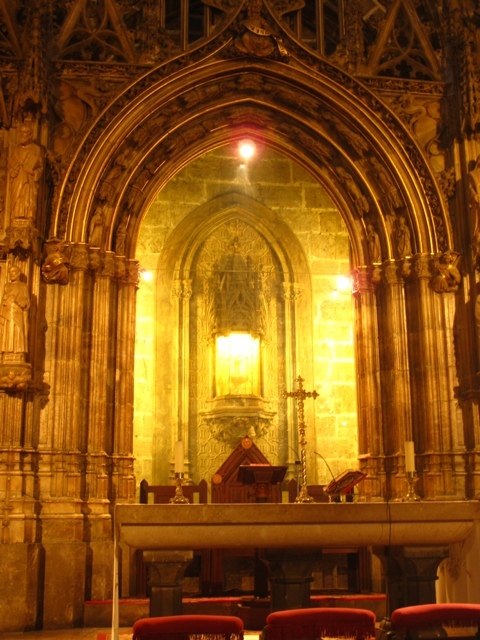 The story goes that the holy cup, or stone dish, or holy chalice, in the Saint Mary of Valencia Cathedral was allegedly taken by Saint Peter to Rome during the 1st century. Thereafter, Saint Lawrence supposedly brought it to Huesca, Spain in the 3rd century where it was guarded and protected from Islamic invaders of the Iberian Peninsula. 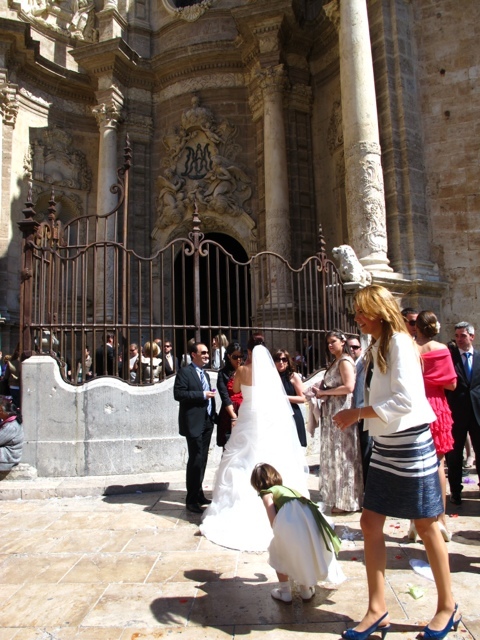 I have been to quite a number of pilgrimage sites yet I hardly listed Valencia among my must-visits. And I only read about it when I started researching on Valencia’s attractions. Makes me wonder. And quite frankly, I have not heard of the other legends involving the Holy Grail. From the Cathedral, we walked towards the Plaza Dela Virgen where we found another cathedral door, again with intricate stone carvings of the 12 apostles. Some with heads, some without. 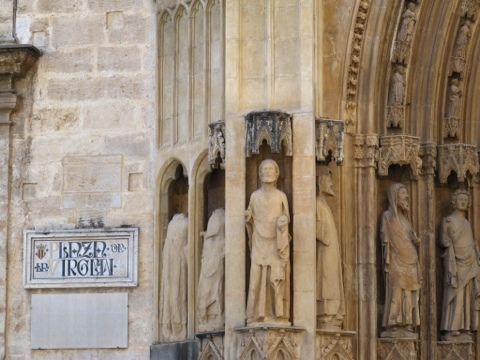 This is the same portal where the Tribunal de las Aguas meet on Thursdays to settle disputes involving irrigation water. 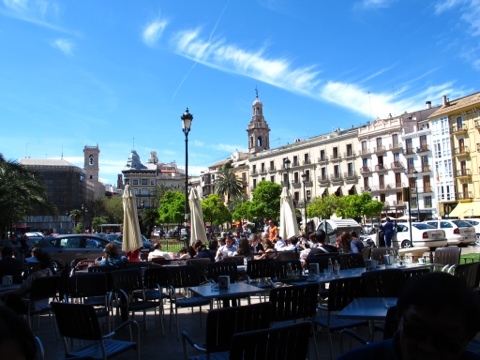 Lining the Plaza are many shops and dining places which overlooks the lovely Turia fountain. But this I must say, everywhere you look is pretty. There are always some spires or towers somewhere. 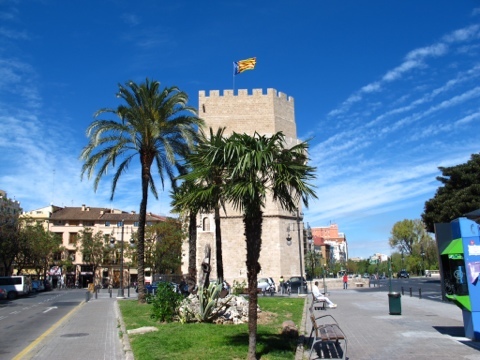 We chose to walk away from the Cathedral towards Torre de Serranos. Didn’t bother to climb up. 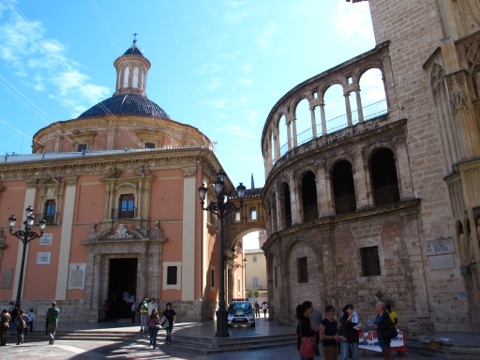 Meandering around bends and corners, we found ourselves back in the Plaza de la Reina right in front of Miguelete Tower of the Cathedral. By this time, we’ve peeled off our cardigans and coats as temp soared to 27 Celsius! Thus, we paused here to catch our breath and at the same time witness a wedding ensemble. Bride and Groom busily accepting congratulatory kisses from friends. Now, what is that little girl looking for?